and how to ratchet up the suspense with each turning page." Welcome to thirteenth century England where our assumptions about the medieval world may be shaken and the inhabitants of those distant centuries begin to resemble friends, neighbors, and even family. As a writer of historical mysteries, I want to honor the past by allowing characters to speak and act within the context of their world but without making the mistake that everyone thought and behaved exactly the same. Language and fashion may change, but human nature does not. And keep in mind that what is the past to us was the immediate present to our ancestors, just as today will be history to our descendants. 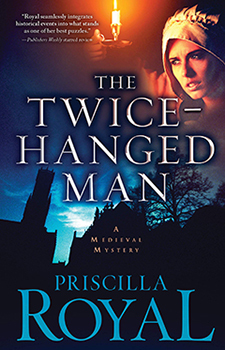 Coming this August from Sourcebooks/Poisoned Pen Press is The Twice-Hanged Man, the 15th in my series featuring Prioress Eleanor and Brother Thomas of the Order of Fontevraud. King Edward's war against the Welsh is not progressing as he wished. Crucial battles have been lost. Raids against English communities are common. Prioress Eleanor (with Brother Thomas and Sister Anne) convinces her brother, Robert, to leave Marcher lands for a safer haven, but their journey ends abruptly when his pregnant wife gives birth. Site design © & maintenance by xuni.com. All content © 2014-2019, Priscilla Royal.